Federal census records are not the only population enumerations you can find for ancestors in the United States. You may also find census records at the state, territorial, and local level for certain areas of the United States. Several state and territorial censuses have become available online. 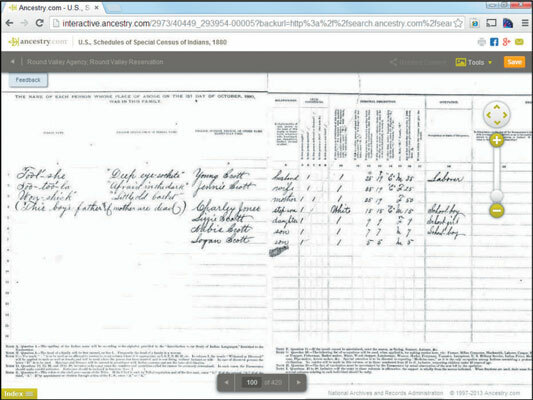 Ancestry.com has, within its subscription collection, state and territorial censuses for Alabama (1820–1866), California (1852), Colorado (1885), Florida (1867–1945), Illinois (1825–1865), Iowa (1836–1925), Kansas (1855–1925), Michigan (1894); Minnesota (1849–1905), Mississippi (1792–1866), Missouri (1844–1881), Nebraska (1860–1885), Nevada (1875), New Jersey (1895), New York (1880, 1892, 1905), North Carolina (1784–1787), North Dakota (1915, 1925), Oklahoma (1890, 1907), Rhode Island (1865–1935), South Dakota (1895),Washington (1857–1892), and Wisconsin (1895, 1905), as well as a host of other census records, including images of the U.S. Indian census schedules from 1885 to 1940. Another source for state and territorial census images is at the free site HistoryKat. HistoryKat has images for Colorado (1885), Florida (1885), Illinois (1820–1865), Iowa (1836), Minnesota (1857), New Mexico (1885), Oklahoma (1890, 1907), and Wisconsin (1836–1847). 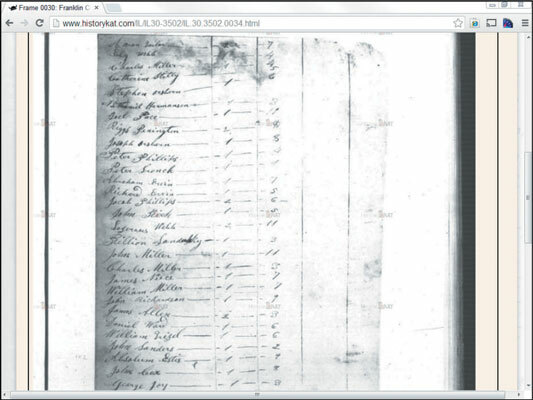 The figure shows an image from the 1820 Illinois state census for Franklin County. Indexes and some images for state and territorial censuses are also found at no charge on FamilySearch. Locations available on the site include Alabama (1855, 1866), California (1852), Colorado (1885), Florida (1885, 1935, 1945), Illinois (1855, 1865), Iowa (1885, 1895, 1905), Massachusetts (1855, 1865), Michigan (1894), Minnesota (1865–1905), New Jersey (1885, 1905), New York (1855–1925), Rhode Island (1885–1935), and South Dakota 1905–1945).